When you think gaming and laptops, images of massive, dictionary-thick machines come to mind. Notebook computers purpose-built for PC gaming are only barely portable, but Nvidia wants to change that with a new approach to hardware and software design for laptops called Max-Q that lets mobile gamers have their cake, and easily carry it too. Revealed at the Computex 2017 tradeshow currently underway in Taipei, Taiwan, Nvidia is calling its new approach to gaming laptops Max-Q Design; a term borrowed from the aerospace industry used to describe the extreme stresses on a rocket during launch. And that seems very appropriate, because designing computers to play modern PC games with high-frame rates and detailed graphics is all about dealing with power and heat. But the crux of the new Max-Q Design philosophy is all about maximizing efficiency in a laptop to balance its size and gaming performance, instead of just trying to cram as much power and heat management hardware into a barely portable piece of hardware that sounds like a jet engine revving up. The Max-Q design approach encourages hardware manufacturers to improve everything from a laptop’s thermal management, to its electrical design, to even its software and drivers, so that the graphics and performance of PC games doesn’t have to be sacrificed for portability. Thinner, lighter gaming laptops are already starting to slowly appear, and it’s inevitably the direction that machines like this were headed. So to a certain degree, Max-Q is a clever way for Nvidia to brand and market the progress that’s been made in shrinking gaming laptops. But by promoting just how thin and light these machines can be, Nvidia is also making it more acceptable for gamers to accept minor performance compromises in exchange for a laptop they’re actually able to carry around. How will Max-Q Design improve gaming laptops? Think thin. Many high-end gaming laptops on the market today that rely on Nvidia’s GeForce GTX 880M graphics card measure in at somewhere around 50-millimeters thick. For comparison, Apple eventually squeezed the MacBook Air down to just 13-millimeters in size. All of that extra bulk in the current crop of gaming laptops is needed to handle and dissipate the heat generated by the GPU, CPU, and other internal components running at full capacity. But following the Max-Q Design guidelines, a gaming laptop packing a mobile version of the GeForce 1080 graphics card, with a 70 percent performance increase and 50 percent less power consumption, will measure in at around 18-millimeters thick, and weigh somewhere in the neighborhood of just five pounds. By comparison, the 15-inch MacBook Pro, Apple’s top-of-the-line portable, is 15.5-millimeters thick and weighs around four pounds, but with just a Radeon Pro 455 graphics card on board. The new Max-Q hardware boasts a 40 to 50 percent increase in efficiency over the gaming laptops currently available, which reduces the need for heavy heatsinks and bulky fans for cooling. Fewer fans means they’ll be quieter too. An optional Whisper Mode can be activated which will automatically reduce a game’s frame rate, or graphics quality, to further reduce the load on the graphics card and its cooling needs. By studying gamer habits, Nvidia has created custom Whisper Mode settings for over 400 popular titles, balancing frame rates versus graphics quality to ensure an optimal gaming experiences as each title requires, with less stress on the hardware. What laptops will feature Nvidia’s Max-Q Design? 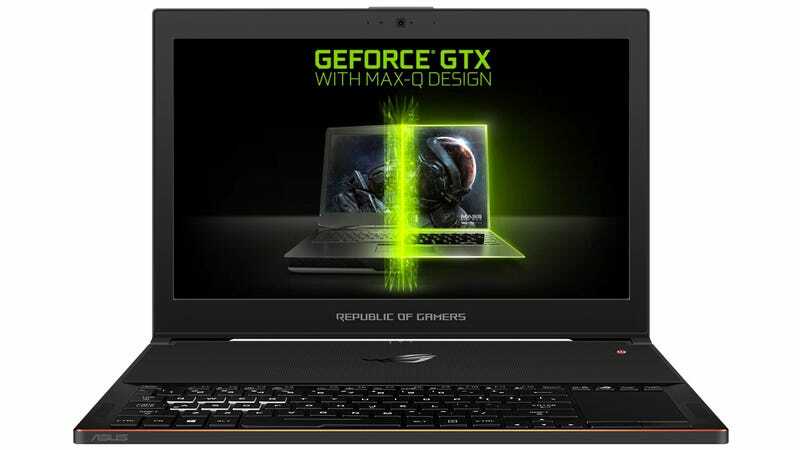 The flagship laptop that Nvidia is using to show off what is capable with the Max-Q approach, the Asus ROG Zephyrus, powered by a quad-core Intel Core i7-7700HQ, 8GB GTX 1080, and up to 24GB of DDR4 RAM, measures in at 17.9-millimeters thick when closed. But that expands by an additional six-millimeters when opened to create a vent on the underside for extra airflow. And that’s a great example of how Max-Q is using clever design tricks to increase performance, not just raw power. At 19-millimeters the Clevo P950HR is a little thicker than Asus’ first Max-Q laptop, but it weighs just 4.18 pounds with a GeForce GTX 1070 inside. It will also come with an optional 3840x2160 display upgrade over the default 1920x1080 HD screen, for gamers who want to go to 4K without the need for an external display. The lightest of the Max-Q laptops announced at Computex is MSI’s GS63 which comes in at 3.96 pounds and 17.7-millimeters thick. Inside is a GeForce GTX 1070 cooled by MSI’s “Cooler Boost Trinity” technology that relies on five different heat pipes in addition to a custom-designed cooling fan. Laptops are supposed to prioritize portability over everything else, but to date that has always included a hefty sacrifice when it comes to graphics and gaming capabilities. No one playing Overwatch on a regular basis is going to buy a MacBook Air, but that could soon change. By encouraging hardware makers to design their machines as efficiently as possible, Nvidia has finally found a way to incorporate the same chips used in its clunky desktop graphics cards in a laptop that’s sleek enough to be carried to and from work every day. Serious gamers no longer need to lug around a 20-pound beast, or have a separate machine dedicated to just gaming. Nvidia’s Max-Q Design approach could also be what modern virtual reality hardware like the Oculus Rift or HTC Vive need to finally take off. Those VR headsets require a powerful computer to create their 3D virtual worlds, limiting where they can be used. But with a powerful Max-Q laptop tucked away in your backpack, suddenly your morning subway commute becomes less of an ordeal when you can spend the time exploring a whole different world between stops.